NEW YORK—As a way of saying “thank you,” City Comptroller John Liu’s 2013 mayoral campaign was purchasing print ads for companies that donated to them. Liu’s former treasurer, Jia (Jenny) Hou, and a fundraiser, Xing Wu (Oliver) Pan, were found guilty on May 2 by a grand jury in Manhattan’s southern district federal courthouse for attempting to defraud New York City by using straw donors to illegally obtain public matching funds. For every $1 in qualifying funds, a candidate can apply for an additional $6 from the city under a matching funds program. During the trial, witnesses from Chinese businesses confirmed they received print ads from Liu’s campaign after donating, and email records backed up the claims. In a September 8, 2011, email shown to the court, Hou told a businessman that the Liu campaign would be publishing ads for his company in all major Chinese newspapers. The businessman, Yi-Lang (Alex) Lu, who was the special assistant to the President of W&L Group Construction Inc, Wuang Meng (Thomas) Hua, admitted in court that he recruited straw donors for Liu’s campaign on behalf of W&L. He raised $15,200 for Liu, and made the campaign eligible for an additional $19,950 in public matching funds. The scheme to reimburse businesses with print ads fits in with a discussion between Pan and an undercover FBI agent, which was captured on July 27, 2011, by a hidden video camera. Pan tells the agent that Liu called him to make a strategy to help raise four or five million dollars for his mayoral campaign. “I say, ‘John, actually quite easy, people donate, we give something in return,’” Pan says in a transcript. Pan is the executive vice chairman of the Fukien American Association, a Chinese communist party front group, and the United Fujianese American Association. The Fukien American Association is affiliated with the Fuk Ching gang, which is involved in human trafficking, extortion, and protection rackets according to a report “Chinese Transnational Organized Crime: The Fuk Ching,” by James O. Finckenauer, Ph.D., at the National Institute for Justice, which is a branch of the U.S. Department of Justice. The Fukien American Association is also “one of the leading [China]-supported organizations, they became the host of almost all these Chinese officials who are visiting New York,” according to Ko-lin Chin, a Rutgers professor and a leading expert on organized crime in Asian communities. 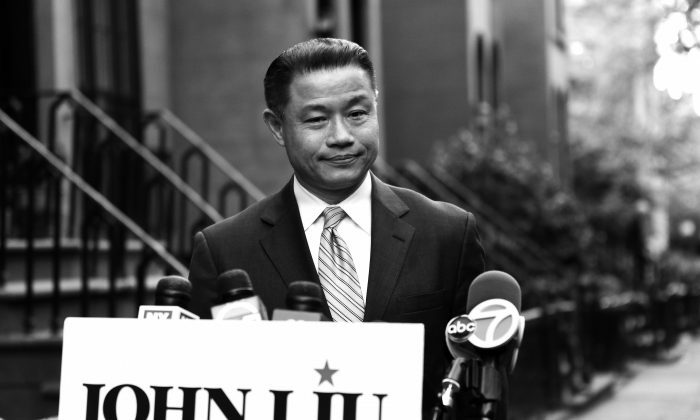 Comptroller John Liu’s former aides were found guilty by a grand jury today at Manhattan’s Southern District federal courthouse.